An ex-husband’s attempts to “win back” his former partner left her terrified and ended with him being sent to jail. George Maclean (37) would not take no for an answer, sending her text messages every day, showing up at his ex-wife’s home and workplace and trying to give her a lift in his car. 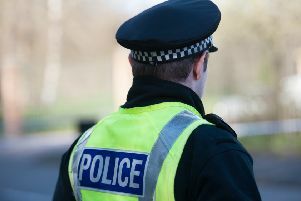 Appearing from custody at Falkirk Sheriff Court last Thursday, Maclean, 1 Braeside Place, Laurieston, previously admitted engaging in a course of conduct which placed his ex partner in a state of fear and alarm at addresses in Manse Place, Falkirk and South Bridge Street, Bathgate. Fiona Nairn, procurator fiscal depute, said: “The accused and the complainer were in a relationship for 14 years and were married for 11 years of those years. They have been separated for three years, divorced for two and have three children age 16, 14 and ten. “Between September 1 and October 12 the complainer received a large number of unwanted texts from the accused, mostly seeking to win her back on an almost daily basis. She told him to stop contacting her. “He then came to her house and she asked him to go away. On another occasion the complainer was at her workplace in Bathgate, working alone at around 8pm when she noticed a light shining through her window. Things came to a head when Maclean came over to her house again saying he would run her to the garage to pick up her car which was there being serviced. The procurator fiscal said: “She wasn’t sure how the accused knew the whereabouts of her car. She declined the lift and made her mother aware of the conduct of the accused and her mother contacted the police. The court heard Maclean had already spend the equivalent of a three month sentence in prison and now realised he had to let this relationship go. Maclean was sentenced to eight months in prison, back dated to October 14 and a non-harassment order was imposed so he could have no contact with his ex-wife for six years.